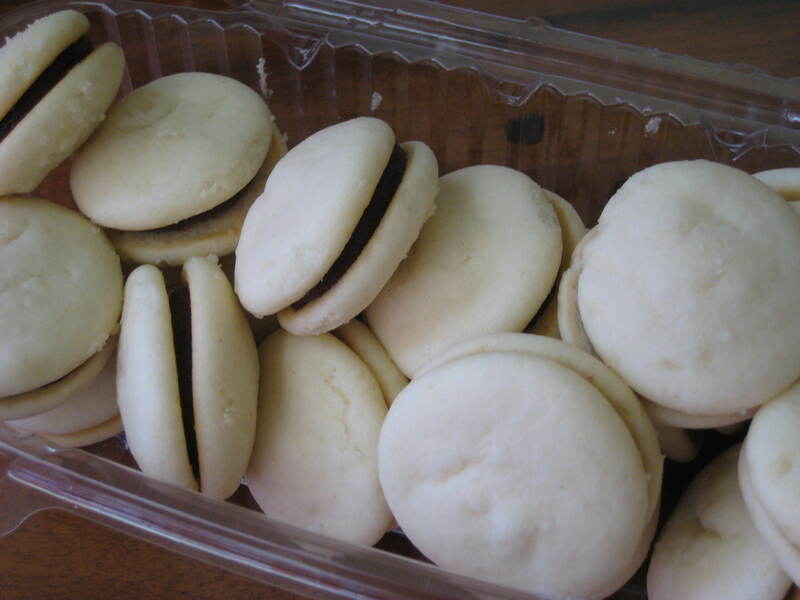 I don’t know what it is about whoopie pies that I love so much; possibly the fact that it’s a cake you can hold in your hand without getting frosting everywhere, or just that it’s so fluffy and creamy just the perfect little bite of cake when they’re mini. 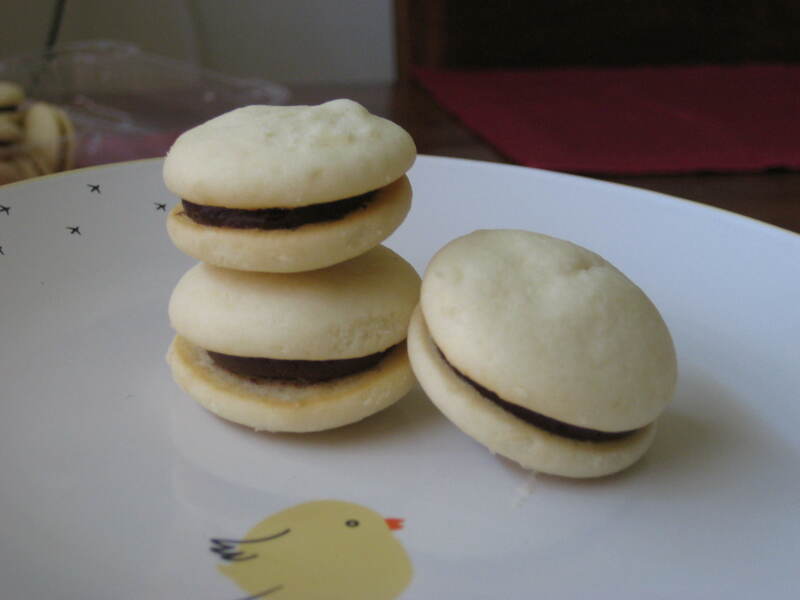 The first time I had a whoopie pie was during a trip to San Diego; they were mini pumpkin whoopies, and they were just so adorable and perfect for a sweet snack that I knew I had to make some of my own. This recipe uses both buttermilk and cream cheese to keep it fluffy and moist. Ready to take home! The filling is an American mocha “buttercream,” also known as 7 minute frosting. It’s ridiculously simple to make, and delightfully creamy and smooth when made correctly. I can honestly say this is one of my favorite recipes that I’ve come up with thus far! In a bowl of a mixer fitted with a paddle attachment, cream together butter, cream cheese, and sugar until very light and fluffy, about 5 minutes. Scrape sides of bowl, then with mixer running, add the egg and mix until just incorporated. In a small bowl, whisk together cake flour, baking powder, and salt until combined. In another bowl, combine buttermilk and vanilla extract. Add 1/3 of flour mixture to batter, mix until combined. Scrape sides of bowl, then add 1/3 of buttermilk mixture. Continue adding ingredients in this manner until all ingredients are thoroughly combined. Line 2 large sheet pans with silicon mats or parchment paper, then pipe 1″ circles of batter onto pans, keeping each of them 1″ apart. Bake at 350F, for 8-9 minutes until cakes are risen and spring back when touched in the center. Cakes should not brown. Let cool completely before removing from pans. In a medium bowl, whisk together powdered sugar and cocoa powder until there are no lumps. In a bowl fitted with a paddle attachment, cream butter until very light and airy. Add cocoa sugar mixture, then (slowly) mix until incorporated. Add coffee extract, scrape sides with a rubber spatula, and let mix until all ingredients are incorporated. Pair cakes together so that they are all fitted with a cake that is the same size. On one cake, pipe a quarter-sized amount of filling, then sandwich with the top piece, and enjoy!